River fishing can be very productive if you have a few tricks up your sleeve. 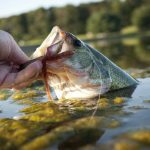 Before getting started in river fishing it is important to know that pollution can be a real issue in and around urban areas. It’s hard to tell whether water is polluted by simply looking at it. 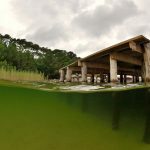 The lack of water clarity is not always the result of pollution. Water clarity can be the result of sediment being stirred up by water turbulence. 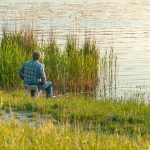 With that in mind, it is always a good idea to check state and local authorities when fishing in rivers because you need to know what fish you can bring to the table as well as being aware of the current river conditions. 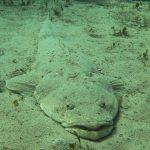 For example, the Derwent Estuary Program and the Tasmanian Director of Public Health release a yearly publication to help anglers know what is safe to eat and what to avoid. This information is also available on their website. If you are fishing for fishing’s sake and you choose to catch and release, this is not so much of an issue. 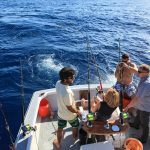 Nevertheless, it always pays to know the water conditions and be fully aware of any fishing limits and related regulations as well as pollution levels. My river fishing tips are designed to help you find more fish and increase your success rates. I am a casual fisho and I am happy to catch just about anything that comes my way. These tips are not specific to any particular species. Dams and water locks are designed to control the flow of water. Indirectly, they also control the flow of fish. These structures can be a great place to catch fish because of the water depth and temperatures. Remember not to take fish with you. It’s not our job to spread the species. A lot of good fishing can be found in areas without heavy currents. Anywhere you find an area of weeds, you have probably found an area for successful fishing. Fish tend to group together in calm areas of a river with weeds because they offer excellent cover. Some rivers have islands. These too provide areas of calmer water. The slack area around islands provide a great place to fish. Where rivers make hard turns, the outer bank normally has deeper water, which makes for a great spot of river fishing. Dropoffs provide for deep areas where resting fish will congregate. Feeding fish tend to be found on the upstream side of a dropoff. Boulders help to form calmer areas of water on the upstream side of the boulders, not on the downstream side as you may think. Sometimes fast moving water will wall up against an area of slow moving water, especially as the result of some kind of obstruction such as a fallen tree. Fish the slower side of the current edge while staying close to the seam. I’ve always found bouncing live bait very effective when fishing in rivers. The idea is to bounce your bait along with the current and not against it. Water flow is normally slower at the bottom of rivers and there is more about for fish to eat. Polarised sports glasses are excellent for fishing. Depending on the conditions, they can greatly help you to see through the water. There’s nothing like having the advantage of being able to see your targets. 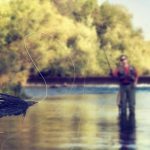 Do you have any river fishing tips you would like to add to this article? Share your experience through the comments section below.